Tennis elbow (lateral epicondylitis) is a condition caused when the muscles on your arm get inflamed from certain repetitive movements of the wrist, like gripping or squeezing. Tennis elbow can happen to anyone who strains the tendons of the forearm, not just tennis players. Using Finsell's Tennis Elbow brace provides immediate pain relief on the affected muscles. The strap can be placed directly on the affected area for compression of the upper forearm, effectively absorbing the impact through the soft tissues to the point of pain on the outside of the elbow. With the compression pad, you can specifically target where you need the compression most, and it conforms to your shape. it can make a practical gift for the whole family. HOW IT WORKS: By compressing the upper forearm and absorbing the forces which are transmitted through the soft tissues, the brace can relieve pain and prevent injury of tennis elbow or tendonitis resulting from participating in any activities that require repetitive arm, elbow, wrist, and hand movement, especially while tightly gripping something. PAIN AND DISCOMFORT ELIMINATION: Not only a great preventative measure for joint pain, this product also helps you recover from severe muscle tissue pain, and minimize the pressure on the elbow. 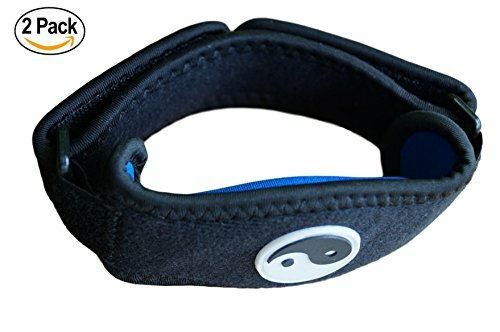 Those who suffer from golfers elbow, carpal tunnel syndrome, arthritis, lateral epicondylitis, repetitive stress injuries will also benefit from this elbow support bracelet. VERSATILE, ONE FOR ALL: One size fits most and can be used on the left or right forearm. Works great for women and men as it comes with the adjustable strap. This is a hook and loop strap and we guarantee that it will not cut off circulation or have a tourniquet effect on your forearm. Can complement or replace elbow compression sleeves. WIDE COMPATIBILITY: A must have for those who suffer from tennis elbow and tendonitis, like Drivers, golfers, baseball players, bowlers, gardeners, landscapers, cleaners ( vacuuming, sweeping, and scrubbing), carpenters, mechanics, and assembly-line workers, etc. 100% MONEY-BACK GUARANTEE: Don't worry about money, we are so convinced in our elbow brace that if they don't live up to your expectations you can send them back for a full, complete refund so you got nothing to lose! If you have any questions about this product by Finsell, contact us by completing and submitting the form below. If you are looking for a specif part number, please include it with your message.